The airline traces its roots to McGee Airways, which flew its inaugural service between Anchorage and Bristol Bay in 1932 with a single-engined, three-passenger aircraft. Mergers and acquisitions produced changes in the name and saw business expand throughout Alaska and the USA. The name Alaska Airlines was adopted in 1944. Alaska's sister (and wholly owned) airline, Horizon Air, was founded in 1981 to serve communities using routes vacated by larger airlines after the Airline Deregulation Act of 1978. In 1985, Alaska Air Group was formed as a holding company for Alaska Airlines. A year later the holding company acquired Horizon Air Industries and Jet America Airlines, which merged into Alaska Airlines in 1987. The airline employs 10,040 staff (at January 2005). Alaska's route system spans more than 40 cities in the United States, Canada, and Mexico. They formerly flew to the Russian Far East. Alaska's reputation for outstanding service has earned it high marks from sources such as Travel&Leisure and Condé Nast Traveler magazines. The airline is considered an early adopter of technology, and was one of the first to sell tickets on their own website, allow web check-in, and install self check-in kiosks at airports. Alaska has historically been one of the largest carriers on the US west coast as well as to and within the State of Alaska, with strong presences in Seattle, Portland, the Bay Area and the Los Angeles Metro Area (all five airports). In about 2000, Alaska began providing long-haul routes to the East Coast. It currently offers nonstop service from Seattle to Boston, New York, Washington, DC, Miami, Orlando, Chicago, Denver and Dallas. 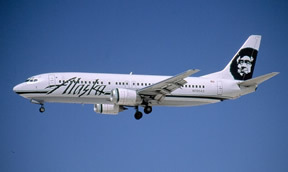 Alaska Airlines operates more international flights from LAX than any other airline, with extensive services to Mexico. The following cities in Mexico are currently served from LAX: Loreto, Los Cabos, Puerto Vallarta, Mazatlan, Manzanillo, Ixtapa/Zihuatanejo, Guadalajara, Mexico City and Cancun. Alaska also serves Vancouver from Las Vegas, Los Angeles, Palm Springs, San Diego, San Francisco, and Seattle, as well as Calgary from Los Angeles and Seattle. In 2003, the airline was granted a slot exemption by the US Congress to operate nonstop flights from Ronald Reagan Washington National Airport to Los Angeles. Alaska Airlines' regional carrier, Horizon Air, is closely integrated into Alaska'a operations, with Alaska and Horizon sharing many routes. Alaska and Horizon are owned by the same parent company, Alaska Air Group.